Halušky are what really defines Slovak cuisine. The name is typically translated to English as potato dumplings, but this is not quite right. Halušky are just that, halušky (pronounced halushky). Potato dumplings, in Slovak, are zemiakové knedľe. 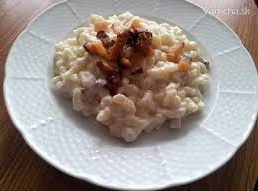 Halušky are somewhat similar to German spätzle. You can top them with just about anything. The most typical topping is bryndza, a special sheep cheese, and fried bacon bits. This combination gives you bryndzové halušky, the Slovak national dish. Another popular topping is cabbage. I also like them very much with a hard boiled egg. Often you will find these dumplings served with stews like goulash or paprikash. Bryndza is a special cheese made out from sheep’s milk. It can be replaced by a cottage cheese made from cow’s milk but then it cannot be called Bryndzove halusky in Slovakia any more – it is Halusky s tvarohom (Dumplings with cottage cheese). Peel and finely grate potatoes. Add flour in order to make a dough or mixture which is not too tough but not too watery. Add salt to taste. Prepare large pot with with 2 tbsp of salt. Place the dough on a wooden board. Then using a knife, “toss” the halušky into boiling salted water. Smaller, the better. Alternative: place grater (flat one, with larger holes - 0,5cm) on side over pot with salt water. Put two table spoons of prepared dough on top of grater and press dough with a spoon through directly into the hot, almost boiling water. Wait until the "halusky" swim up to the surface (few minutes), collect them with a large perforated spoon and place in a bowl. Add fresh sheep chese (bryndza), butter and gently mix. On a pan fry smoked bacon cut into small cubes. Serve finished halusky warm, on plate with crispy bacon cubes topping. If you need a healty version you can use wholemeal flour and use only butter and no bacon.